This article was brought to you in partnership with the new movie LIFE, in theaters March 24th. LIFE is a sponsor of IFLScience. In the movie Life,, astronauts aboard the International Space Station (ISS) retrieve a sample from Mars that contains the first evidence of alien life. Things don’t quite go to plan when the small organism turns out to be hostile – but could we really find life on Mars or elsewhere? There are three basic ingredients for life as we know it: liquid water, a source of energy, and organic compounds. We know of at least one place that definitely has all three, Earth, and in our case life managed to thrive. Perhaps it could exist on other worlds, too, like one of the thousands of planets we’ve found in our galaxy so far. Astronomers have long pondered the question of whether we’re alone in the universe, as have science fiction authors. People once imagined hostile aliens visiting Earth from Mars and beyond, sometimes traveling many light-years to take over our world. This fear of aliens is certainly often played on, but we may not have too much to be afraid of just now. In our own Solar System at least, intelligent life looks rather unlikely. If there is any life here other than on Earth, it is probably microbial and confined to the subsurface of Mars, or maybe one of the oceans hidden under the icy moons, Europa and Enceladus. Whether a multicellular organism like that depicted in the new intense thriller Life could exist is up for debate, but some of the ingredients for basic life seem to be there. Mars looks pretty promising based on the fact that we think it once had vast amounts of water, a vital ingredient for a habitable environment. The planet appears to have gone through multiple periods of wetness that may have been conducive to life. Today, the atmosphere on Mars is too thin to support liquid water at its surface, which would immediately boil. But several billion years ago, we think it had a thicker atmosphere somewhat similar to Earth’s that would have allowed bodies of liquid water to exist. Evidence from NASA’s Curiosity rover suggests that the location it is currently exploring, Gale Crater, was the site of an ancient lake. 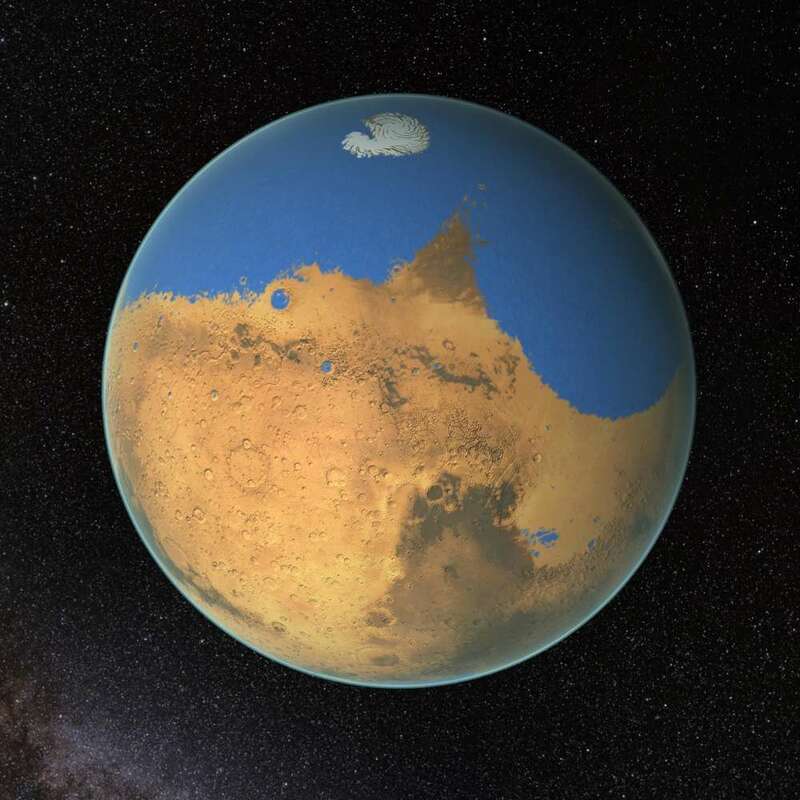 Other evidence points to the northern hemisphere of Mars once having more water than the Arctic Ocean. Indeed, we can see signs of ancient coastlines today. And with water there, that makes things interesting. Upcoming missions, including NASA's Mars 2020 rover and ESA's 2020 ExoMars rover, will look for signs that something once survived on the planet – or even still does today. It’s possible that a future Mars sample return mission, like the one in the new movie Life, could give us a clearer answer. If we want to find intelligent life though, we may have to look beyond the Solar System. But this does beg the question that, if life is out there, should we even be looking for it? Some experts have argued that any race more advanced than us might try and wipe us out for our resources, a fearful scenario imagined in countless works of science fiction. “One day we might receive a signal from a planet like this, but we should be wary of answering back,” Stephen Hawking said last year. “Meeting an advanced civilization could be like Native Americans encountering Columbus. That didn't turn out so well." This hasn’t stopped people from trying to get in contact. Over the last few decades, scientists at the SETI (Search for Extraterrestrial Intelligence) Institute in California and elsewhere have been listening to star systems to see if there are any artificial signals being sent our way. So far, nothing – but there’s no harm in trying. We’ve also tried to send our own direct messages out, too. 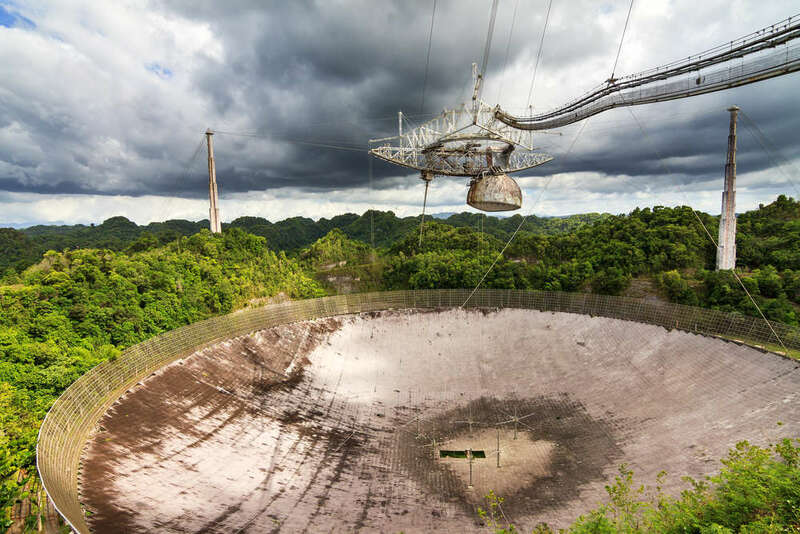 In 1974, astronomers used the Arecibo radio telescope in Puerto Rico to send a package of information to the globular star cluster M13, using binary data to transmit some basic information about humans and Earth. Other messages have been sent since then, and a few spacecraft – the Voyager and Pioneer spacecraft – carried plaques containing images and sounds of Earth. It’s unlikely these will ever be found by anyone, human or otherwise, but the idea behind it was at least quite interesting. Back in our Solar System, there are a few other promising locations for microbial life at least, such as Jupiter’s moon Europa. It is encased in ice, but it’s thought that at least 15 kilometers (9 miles) below the surface, it holds a vast ocean that might stretch 25 kilometers (15 miles) or more in depth. Europa’s orbit around Jupiter is slightly elliptical, and the push and pull of the planet may be tidally heating the interior of the moon. This could supply its ocean with a source of energy at the seafloor, possibly giving rise to hydrothermal vents. 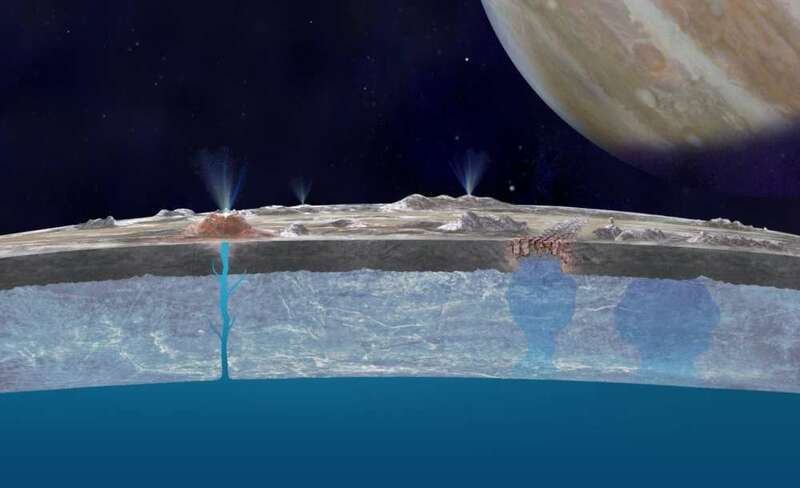 A study last year suggested that Europa may also have the necessary balance of chemical energy for life. The only problem is, it’s going to be quite hard to study this ocean, because of the thickness of the ice above. A proposed lander from NASA in the next decade, however, would land on the surface and study material there, giving us an insight into whether the ocean is actually habitable or not. ESA’s Jupiter Icy Moons Explorer (JUICE), meanwhile, planned to launch in 2022, should tell us more about the moon and its ocean. Similar problems abound for Saturn’s moon Enceladus. This moon is also thought to have a thick icy shell with water underneath, but it seems to be spouting some of this water at its south pole. The Cassini spacecraft, currently in orbit around Saturn, flew through some of these plumes to sample them, finding traces of organics. Like Europa, Enceladus is thought to get energy from its elliptical orbit around Saturn, and together with organics and water, it has all the building blocks for life. A NASA proposal is on the table to send a mission here in the 2020s called the Enceladus Life Finder, which would fly through the plumes of the moon multiple times to work out what it’s made of. Perhaps the most promising place to find life will not be in our Solar System at all, though. Outside of it, we are finding more and more exoplanets that may have suitable conditions for life to exist, lending itself to the idea of advanced alien races living on other worlds. In 2011, one particular world 600 light-years away had people appropriately excited. This was Kepler-22b, the first world found in the habitable zone of a Sun-like star, meaning it could have the right temperature for liquid water to exist. Unfortunately, at 2.4 times the size of Earth, it’s more likely to be an uninhabitable gas planet than a rocky world. April 2014 brought a new discovery, with the first Earth-sized planet in a habitable zone. Kepler-186f, about 500 light-years from Earth, is less than 10 percent larger than Earth. But its star, a red dwarf, is about half the size of our Sun. If there is life here, it may have to make do with much less energy than on our world. So Kepler-452b, announced in July 2015, might be a better bet for life as we know it as it’s Earth-sized, has an Earth-like orbit, and orbits a star like our Sun. Being much older than Earth, however, it may be more a glimpse into what will become of our planet in the future. Astronomers now think that red dwarfs, comparatively smaller and dimmer than our yellow dwarf Sun, might be the best places to look for life. These are the most numerous stars in the galaxy, and often their habitable zone planets have short orbits of just a few weeks or days, making them easier to study. One interesting system you might have heard of recently is TRAPPIST-1. Just 40 light-years from Earth, this ultra-cool dwarf star has not one but seven relatively Earth-sized rocky worlds, three of which might be in the star’s habitable zone. Studies are beginning in earnest to find out if the atmospheres of these worlds could support life. It’s not just exoplanets that might be interesting, but exomoons too. Often, these planets in short orbits are tidally locked to their stars, meaning one face always points toward the star and thus is constantly in daylight, while the other is in constant darkness. 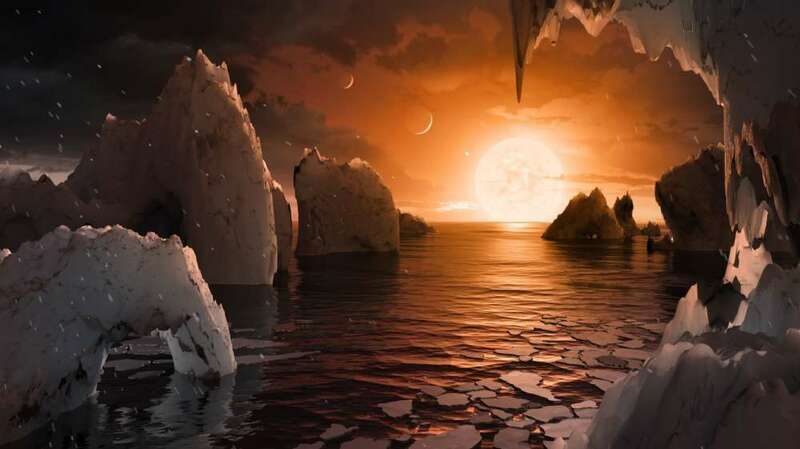 But if these planets have moons orbiting them, then these could be very good places to look for life. The moons would likely rotate in the star’s light, and being in the habitable zone, it’s possible they could be even more attractive than the planets themselves. Many think the discovery of life is on the horizon. Ellen Stofan, former Chief Scientist of NASA, said in 2015 that we might find “definitive evidence in the next 10 to 20 years”. And with worlds like Mars, Europa, Enceladus, and a host of exoplanets looking promising, that detection could come from anywhere. The chances of finding a living, breathing multicellular organism are somewhat slim. 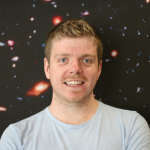 But the odds are ever-increasing that we may find hints of past or present biology in our Solar System or beyond. Mars, of course, is one of the most enticing worlds of all. With it once having a more Earth-like environment, we are getting closer and closer to finding out if it could have been habitable. Perhaps it’ll be a sample laden with biology, like that in the movie Life, that truly gives us the answer one day.